You are in full control of your software, updates, your data and image files. Lots of data fields, many customization options and advanced "pro" features. Store book data & images locally, optionally sync with our free CLZ Cloud storage. Multiple layouts for the main screen folder, list and details panels. List, Images or Card View for your book lists. Different templates for the book details panel. Light, Dark and System skins for all screens. Just search our online books database by author and title or by ISBN. Select the book that you own. The main book details like author, title, publisher, publication date, etc..
Other information like number of pages, genres and subjects, dimensions, etc..
Front cover images, author images, author wiki-page links. 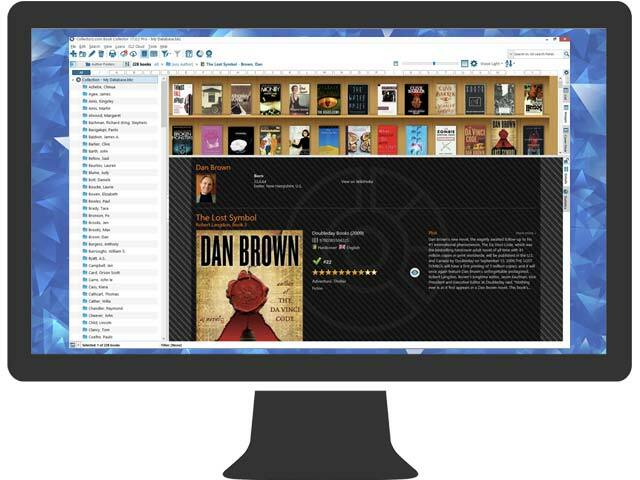 Book Collector can also catalog your e-book files. Just let it scan your computer for e-book files, then link the files to the book entries in your database. After that, the e-books can be opened right from your book details panel. synchronize your book data to other computers and mobile devices. share your book list online, for friends and family (example). Efficiently edit your data using field defaults, batch editing, direct editing in main screen list, etc..
Add missing cover images by searching the internet with the built-in Find Image Online tool. Customize your database by renaming existing fields, or by creating your own User Defined Fields. Manage your loans with the integrated Loan Manager system. Export your book database to Text or XML files. Print book lists in any order, with your configurable columns. OMG thank you for making it easy to re-download and install AND restore my database from a recent backup!!!! I had the blue screen of death yesterday and had to re-install everything, even Windows10. In a panic, I realized my CLZ book database was gone! But I found it easy to restore by clicking on the backup copy and Voila! It is Thanksgiving Day here, and while I have a lot to be thankful for in a life that has been richly blessed with friends and family, I must say that I'm extremely thankful to you and the whole crew at CLZ. I'm constantly learning new things in how to use this program and I'm so grateful that no one ever makes me feel stupid or silly (even when that is the case)!